Merry Christmas from Prayer in Every City. I hope you and your children are enjoying this wonderful day in the Lord. If you have some time today, then read the Christmas story to your children. I will list the story in chronological order beginning with the story of Zacharias and Elizabeth. If you don’t have time to read all this today, then read it over a period of a few days. Our children have heard this story many times over the years and I believe it is important to make sure they know the events in the order in which they happened. The birth of Jesus can only be found in the books of Matthew and Luke, but you need to alternate back and forth to get the story in chronological order. I will not take the time to type out the scriptures, but will only include the scripture references. You may read in any version you choose. If you would like to see the individual lessons which I wrote on each of these then please see my other Advent posts: Advent 1, Advent 2, Advent 3 and Advent 4. I want to draw your attention to one part of the story today that we have not discussed in the previous Advent stories. The reason I want to address this verse is because we need to be aware of false teaching that that is being taught today. Some preachers teach that Jesus was a rich man on earth. They do this in order to support their prosperity gospel. There are some verses in the Christmas story, which refute this false teaching. Please take a look at Luke 2:21-24. 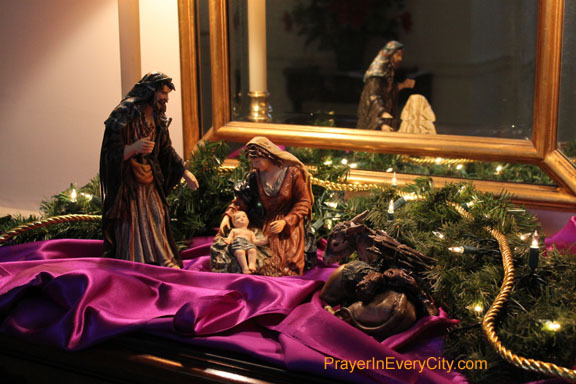 This is the story where Mary and Joseph took Jesus to the temple to be circumcised. According to the Law in Leviticus, every firstborn male that opens the womb shall be called holy to the Lord and the parents were to make an animal sacrifice. According to Leviticus 5:7-11, this sacrifice was to be a lamb. If the family could not afford a lamb, then the sacrifice was to be either two turtledoves or two young pigeons. Look at Luke 2:24 to see what type of sacrifice was offered for baby Jesus, the King of the Jews. It was the poor man’s sacrifice. If Joseph and Mary would have been wealthy, don’t you think they would have offered the lamb knowing that Jesus was the son of God? We need to know what the Bible says so we will not be deceived by false doctrine. The Bible gives us this warning, “we should no longer be children, tossed to and fro and carried about with every wind of doctrine, by the trickery of men, in the cunning craftiness of deceitful plotting, 15 but, speaking the truth in love, may grow up in all things into Him who is the head–Christ– 16 from whom the whole body, joined and knit together by what every joint supplies, according to the effective working by which every part does its share, causes growth of the body for the edifying of itself in love” Eph 4:14-16 (NKJV). So study the Word of God for yourself. As you have learned from my Advent lessons, even the Christmas story is not free from mans false interpretations. We must study the Bible and read it for ourselves. I hope you and your family have a blessed Christmas Eve and Christmas Day.